Amy Klobuchar, Democratic Senator from Minnesota, spoke with CBS This Morning about Supreme Court nominee Brett Kavanaugh’s performance during yesterday’s hearing concerning sexual assault allegations against him. It’s safe to say that Klobuchar was unimpressed by his white bro-rage. KLOBUCHAR: Could you just answer the question, judge? So, that’s not happened. Is that your answer? KLOBUCHAR: I don’t have a drinking problem. “If I was in his courtroom and acted like that, he would have thrown me out,” Klobuchar told CBS This Morning. Kavanaugh later apologized, prompting Klobuchar to explain that having an alcoholic father tends to make one careful about their alcohol consumption. 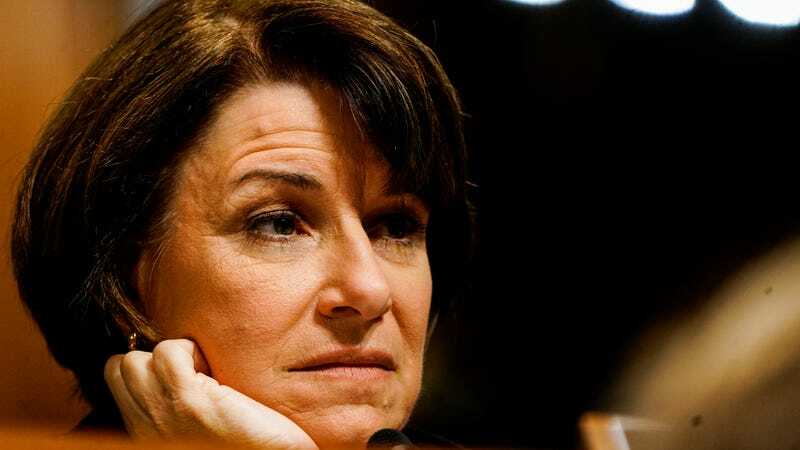 But Klobuchar mentioned her father’s struggles with alcoholism and his attending Alcoholics Anonymous meetings at the age of 90 before she even began asking Kavanaugh about his own history with alcohol, making Kavanaugh’s nervous attempts at snark even more embarrassing. Kavanaugh has repeatedly denied having a drinking problem and described his relationship to alcohol as a simple romance between a man and his beer. This harmless relationship contradicts the claims made by those who knew him at Yale as well as every woman—Christine Blasey Ford, Deborah Ramirez, and Julie Swetnick—who have accused him of sexual assault and misconduct.